Micropore particle technology (MPPT) is a patented technology developed by Willingsford. It is a passive immunotherapy for wound infection and wound healing. MPPT has not been associated with any adverse events. It only consists of natural ingredients and it is fully biodegradable. MPPT is not antimicrobial, it is effective against resistant infections, but it does not contribute to the creation of antimicrobial resistance (AMR). To understand MPPT, it is necessary to know that a healing wound is not sterile, but is populated by a microbiome, an ecosystem of bacteria, fungi, viruses and mites. This microbiome helps the body to prevent and fight infection. Infection is when one or a few species of bacteria or fungi take over control of the wound, i.e. an unbalance in the microbiome. Bacteria and fungi use weapons against the immune cells, when they try to take over control of the wound. MPPT disrupts this weaponry and the result is that the immune cells regain their function. They are now able to remove a wound infection and control the wound healing process (see below). For a detailed description of how it works and comparison to existing therapies, please see this review article in the US medical journal WOUNDS. 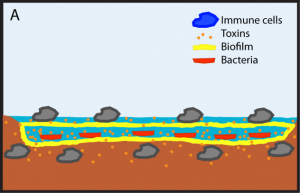 Bacteria and fungi secrete toxins and enzymes, which inhibit or kill the immune cells and hide within a layer of biofilm, which the immune cells cannot penetrate. By using this weaponry, they take over control of the wound. The MPPT-particles act as small micro-pumps on the wound surface. They absorb the wound exudate and in parallel they remove the toxins and enzymes secreted by the bacteria and fungi. MTTP also, by suction, creates holes in the biofilm layer. By these actions, MPPT disables the weaponry used by the bacteria and fungi. 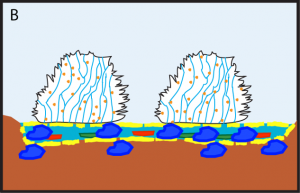 The result is that the immune cells regain their function and can enter the biofilm area. They can now selectively and unhindered remove any unwanted bacteria and fungi. By doing this, the infection is removed and healing can progress. Infected wounds are normally treated with antibiotics and antiseptics, but studies have shown that they have no effect against wound infections and in support of healing. In 2016, the FDA wrote: “The available evidence does not appear to demonstrate improved clinical outcomes from the use of antimicrobial dressings over non-antimicrobial dressings for the prevention or treatment of local wound infections or to improve wound healing”. In a comparative clinical study, which included MPPT, an antibiotic and an antiseptic, MPPT was able to remove wound infections and initiate healing 60% quicker and to reduce the number of hospitalisation days by 31%. In a clinical evaluation on infected dehisced surgical wounds, wounds receiving MPPT were free of infection and had started healing in 4-5 days. Normal care consists of 1 week with UrgoClean followed by 2-more weeks of Negative Pressure Wound Therapy. Estimated savings resulting from the use of MPPT were 67%. In an evaluation on chronic, nonresponding pyoderma gangrenosum ulcers, MPPT was able to promote healing and one patient was able to reduce the dose of immunosuppressant. MPPT was able in animals to reduce the time to reaching a non-infected, healing wound by 60% compared to a topical antibiotic and unassisted healing. MPPT was able to promote healing of chronic, nonhealing venous leg ulcers, diabetic foot ulcers and pressure ulcers. See case reports. MPPT was able in animals to promote the healing of a number of acute and chronic wounds. See case reports. Health-economic calculations indicate that MPPT can reduce the burden of wound care by 21%. MPPT is available for human and veterinary wound healing.